The RP Photonics Buyer's Guide contains 2 suppliers for waveguide lasers. A waveguide laser is a laser which contains a waveguide as the gain medium. Solid-state waveguide lasers are usually based on some planar or channel waveguides in some crystal or glass pieces. Fiber lasers are also waveguide lasers. Essentially all laser diodes are waveguide lasers, with optical guidance at least in one direction. The smaller laser diodes even use single-mode guidance; the larger ones (e.g. broad area laser diodes and diode bars) exhibit multimode behavior at least in one direction. 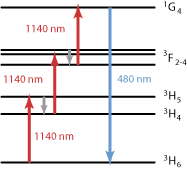 Waveguide structures are also used in some CO2 lasers. The advantages are that the transverse dimensions of the gas tube can be reduced so as to obtain efficient cooling of the laser gas, and that the obtained beam quality can be very high. 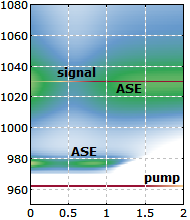 The most important benefit of using a waveguide is that effectively the beam divergence is removed, so that high optical intensities can be maintained over a long length. This in turn makes it possible to achieve a high optical gain and a high gain efficiency even for difficult laser transitions and with limited pump power. However, this benefit may partially be offset by propagation losses in the waveguide, which may be substantially higher than for bulk material. The combination of a long propagation length and small mode area can cause a strong impact of nonlinearities of the material. This can limit the performance of certain devices, whereas in other cases nonlinear effects are exploited in some way. For example, Raman fiber lasers exploit strong stimulated Raman scattering. Thermal effects such as thermal lensing in the gain media are largely suppressed by the waveguiding, particularly in the case of single-mode guidance. As thermal effects are usually weaker than the guiding index contrast, they lead only to a slight deformation of the guide mode, which has no significant consequences. Waveguide lasers can be integrated with other optical elements on the same device, e.g. with optical modulators for Q switching, active mode locking, or wavelength tuning. This is particularly the case when the gain medium is a nonlinear crystal material such as lithium niobate (LiNbO3), or a semiconductor. A waveguide laser may even be part of a complex photonic integrated circuit. An attraction of some planar waveguide lasers is that the pump light from a laser diode can be proximity coupled into the waveguide without any optics in between. Waveguide lasers usually have a monolithic laser resonator, resulting in various advantages such as a stable and compact setup.